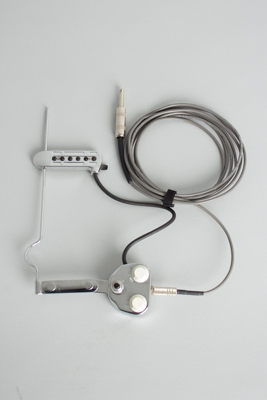 DeArmond Rhythm Chief Model 1100 Model Archtop Guitar Pickup (1969), made in Toledo, Ohio, chrome finish. A cool find, looking little used since new-whch is just about 50 years ago as "Nov 24 1969" is stamped on the bottom of the coil. Very fine sounding, includes a newer high quality cable. Excellent + Condition.